Have A Dog Question? Ask Dog Lady! We love reading dog blogs, and wandered across the Ask Dog Lady blog, authored by Monica Collins. Monica actually writes a newspaper column, also called “Ask Dog Lady”, that is featured in many newspapers across the United States and also syndicated online. The dog blog focuses on how dogs can truly enrich your life, as Monica’s West Highland white terrier did for her! The Ask Dog Lady blog focuses on pet questions and answers, as well as her tips on pet products that actually work, and fun dog posts, such as dog photos and news stories. It’s a dog blog for the dog enthusiast who sees how a dog can really impact your outlook on life and well, just make life happier! Her keen insights are a must for all dog owners to read, and we do hope you’ll head on over and visit the Ask Dog Lady Dog Blog! Love ’em or loath ’em, bridal shower games are an absolute tradition at bridal showers, along with bridesmaids creating bridesmaid gift baskets for the guests to win! Could you really envision a bridal shower without playing bridal shower bingo or competing for the best toilet paper wedding dress designs? We didn’t think so. Here’s a few of our favorite bridal shower games – sure, we’ve played them time and time again, but a bridal shower wouldn’t be complete without them! The Clothespin Game – Each guest receives a clothespin when she walks in, with instructions that if she crosses her legs, her clothespin can be “stealed” by another guest. The guest with the most “stolen” clothespins wins a bridal shower gift basket! Bridal Shower Bingo – Just like regular bingo, but instead of numbers, think “wedding” lingo – “rings”, “vows”, “bouquet”, “honeymoon”, and etc. Wedding Trivia – The bride asks the guests about ten or so questions about herself and the groom-to-be. 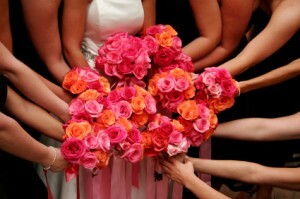 The guest with the most correct answers wins a bridesmaid gift basket! Toilet Paper Wedding Dress – Separate your guests into teams, and give each team a roll of toilet paper. Each team will designate its own “bride” and create her wedding dress out of toilet paper! The real bride-to-be will judge the winner. Changing Gifts – Create two sets of the same group of numbers. Give each guest a number, and pour the other set of numbers into a basket. Have the bride randomly select numbers, and when that guest’s number comes up, she can choose a fun prize. When the next person’s number is called, they can either choose a new gift, or “steal” the gift from the previous winner. “Stealing” should be encouraged to build up some playful banter and keep this game going! Now onto the gifts! Bridesmaid gift baskets have become so popular as bridal shower game prizes. You’re already busy enough planning the shower and getting ready for the wedding, so simply order from us! They’re jam packed with chocolates, tea, cosmopolitan drink mixes, cookies, and more, and we’ve kept our prices low so you can choose a few bridesmaid gift baskets for your guests. If you’ve created a bridal shower gift basket on your own before, you know it isn’t cheap to buy the basket, cellophane, ribbons, and gourmet goodies. Our business pricing allows us to purchase the best of the best at lower prices, and coupled with our thirteen years in the gift baskets business, let us create the most beautiful bridesmaid gift baskets for you! Here’s to a fun bridal shower – share your favorite bridal shower games and prizes by leaving a comment! Oh! How We Love Oh Behave! Dog Training! As you’ve seen in some of our recent blog posts, we’re all about promoting dog trainers that put an emphasis on positive dog training – rewarding dogs for good behavior, rather than punishing them for being well, a dog! Every dog and dog owner has a unique experience with their trainer, so we figured posting about some of our favorites would only be a help in connecting dog and owner with the right dog trainer. Lisa-Anne Manolius from Oh Behave! Dog Training is a perfect example – she’s an honors graduate from the prestigious San Francisco’s SPCA’s Academy for Dog Trainers, and offers services from training sessions, day training, and even phone consultation for the busy dog owners out there! The Oh Behave! Dog Training Blog is another gem – Lisa shares some of her dog training secrets with readers to help them understand why their dog is behaving in the way he’s behaving, and how to get him to behave positively. We encourage you to check out Lisa’s Dog Training Philosophy, and get to know Oh Behave! Dog Training! Curious About The Inquisitive Canine? We had the pleasure recently of being able to connect with Joan the Dog Coach and Poncho the Dog over at The Inquisitive Canine – dog training, workshops, and even virtual dog training! Joan is known for her simple, but lasting dog training techniques that will withstand the test of time, ensuring you have a well-trained dog at home. Her training isn’t simply helping your dog be “good”, it’s all about helping dog and dog owner connect better together and understand each other. Be sure to check out their “Out of the Box” dog training game that helps you establish dog training techniques that add a positive approach to dog training – it’s even available as an iPhone app! The Inquisitive Canine Blog is a great resource for learning more about Joan and Poncho and their approach to dog training, along with tons of great tips. We hope you’ll head on over to their Dog Training website and check out their services! As a bride-to-be, you’re so happy to have your bridesmaids by your side, helping you choose your wedding colors, select the right wedding favors, and most importantly, deal with all the inevitable drama that comes along with planning a wedding! Gifting your bridesmaids before the wedding is tradition, but it’s only natural that you would want to sincerely thank them for lending an ear and a helping hand. Presenting them with jewelry is a common bridesmaid gift, but well, isn’t it nice to do something a little outside the (jewelry) box once in awhile? Here’s some new bridesmaid gift ideas for you! Luxe Dinner: Most brides spend about $100 on each bridesmaid gift. If your bridesmaids tend to prefer getting together for a nice dinner and drinks compared to receiving another piece of jewelry, ask them if they’d prefer you take them out for a fancy dinner and drinks, on you. After all, the memories you make getting all dressed up for a delectable dinner will last forever, and will surely make for one fantastic evening. Spa Gift Certificate: It’ll be nice to relax after the wedding, won’t it? Same goes for your bridesmaids! Visit a local spa and choose spa gift certificates for them, to be used towards any spa service that they’d like. Getting a massage or facial is always a welcome treat, and your bridesmaids will likely be so excited to use them! Create A Registry: Isn’t it so great to choose items for your bridal registry? Let your bridesmaids have some fun by creating their own registry! Give each bride a list of several local stores and the total $ amount you’d like to stay within, and let them “create” a registry of 5-10 items they’d like! This way, you’ll be able to choose gifts each bridesmaid actually wants, while letting them have some fun writing up their own registry. Bridesmaid Gift Baskets: You can really get creative with bridesmaid gift baskets – check out our Bridesmaid Gift Baskets page for some ideas! It’s always fun to discover all the goodies nestled inside a gift basket, and we just know your bridesmaids will adore bridesmaid gift baskets like our Luxurious Vanilla and Ginger Spa Gift Basket, Godiva Favorites Gift Basket, and the CosmoRita mixes inside our Cosmopolitan Gift Basket! 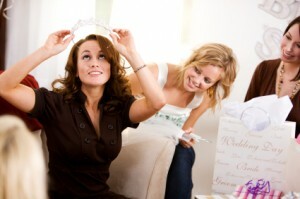 You’re strapped for time planning your wedding, but treating these great ladies in your bridal party is so important. Sure, choosing jewelry or a “typical” bridesmaid gift is a cinch, but taking the time to put some creativity into their gift really shows how much you appreciate their help as you tie the knot! Out of the bridesmaid gifts you’ve received, which gifts stood out as your favorite and least favorite?